Competition and intellectual property rights (IPRs) are both necessary for a market to work efficiently and to promote consumer welfare. Properly applied, intellectual property rules define a legal framework which allows undertakings to profit from their inventions. This in turn encourages competition among firms and enhances dynamic efficiency, to the benefit of consumer welfare. Standard setting represents one of the fields where the interaction between competition law and IPRs clearly comes to light. The collaborative goal of standard setting organizations (SSOs) is to adopt and promote standards that either do not conflict with anyone’s right or, if they do, are developed under condition that patents are licensed under defined terms. 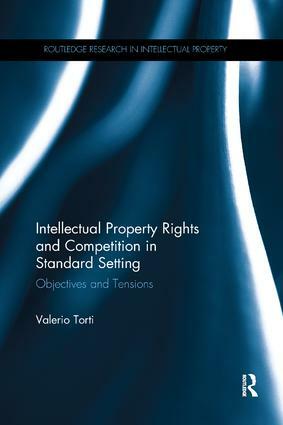 This book examines the tension between IPRs and competition in the standard setting field which can arise when innovators over-exploit the rights they have been granted and hold up an entire industry. The book compares EU and U.S. jurisdictions with a particular focus on the IT and telecommunication sectors. It scrutinizes those practices which could harm standard setting and its goals, looking at misleading conducts by SSOs’ members which may lead to breach the EU and U.S. antitrust provisions on abuse of market power. Recent developments in EU and U.S. standard setting are analysed highlighting the differences in enforcement approaches. The book considers how the optimal balance between IPRs and industry standards can be struck, suggesting a policy model which takes into account both innovators’ interests and SSOs’ goals. Valerio Torti is a Post-Doctoral Research Fellow at the Centre for Law & Business of the National University of Singapore.